J and I decided that for our next brief trip (all of 4 days! ), we were going to be completely unplugged from work. Since starting, I have yet to be separated from my work inbox, with its daily onslaught of patient messages, calls, labs, staff messages, prescription refills, etc, etc. I try to clear it by the end of the day, only to log in several hours later to find that it is once again filled with new things to address. To that end, I brought my phone along on our trip but otherwise made a point of leaving my computer at home. I admittedly had separation anxiety and was fidgeting to check in as day 1 approached. By day 2, I couldn’t believe how it felt to be unplugged. It. was. so. l-i-b-e-r-a-t-i-n-g! As grateful as I am to have an electronically medical record and the technological advances we have, it has so blurred the lines between work and home that I never feel completely done with work. It makes it hard to find some semblance of work-life balance…I went into this field knowing it could and would consume most of my waking hours and energy, but I do not think this means neglecting personal priorities. Physician, heal thyself – otherwise, how can I possibly hope to care for others? 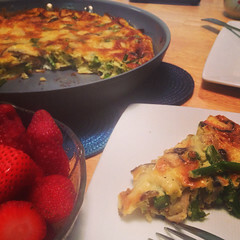 And so, during one of our mornings free, I made this lovely frittata – it felt celebratory in more ways than one, featuring spring’s fresh and sweet asparagus. Heat olive oil in 10-inch-diameter nonstick skillet over medium heat. Add leeks and sauté 4 minutes. Add asparagus and shiitake mushrooms, sprinkle lightly with salt, and sauté until tender, about 6 minutes. 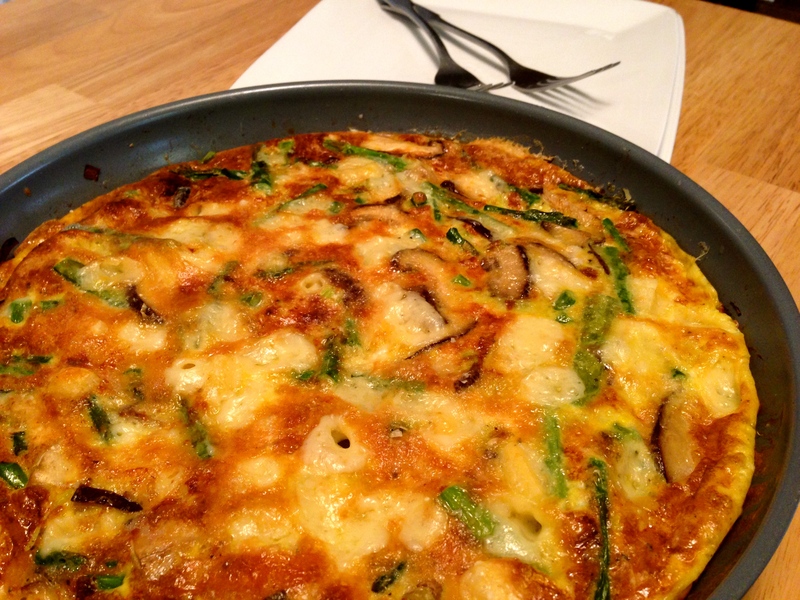 Whisk eggs, 3/4 cup Gruyere cheese, 1/2 teaspoon salt, and 1/2 teaspoon pepper in medium bowl. Add egg mixture to skillet; fold gently to combine. Cook until almost set. Sprinkle remaining 1/4 cup Gruyere cheese and Parmesan cheese over. Broil until frittata is puffed and cheese begins to turn golden, about 3 minutes. Cut into wedges and serve. Shirataki noodles are thin, translucent, gelatinous traditional Japanese noodles made from the konjac yam (aka devil’s tongue yam or elephant yam). They are mostly comprised of glucomannan starch, which is an indigestible fiber. While very low in carbohydrates and calories and lacking much flavor of their own, shirataki noodles easily pick up the flavors of whatever sauce they are in. Their slippery texture may be a little unfamiliar to some, but dry roasting them in a non-stick pan can give them more of a pasta-like consistency. 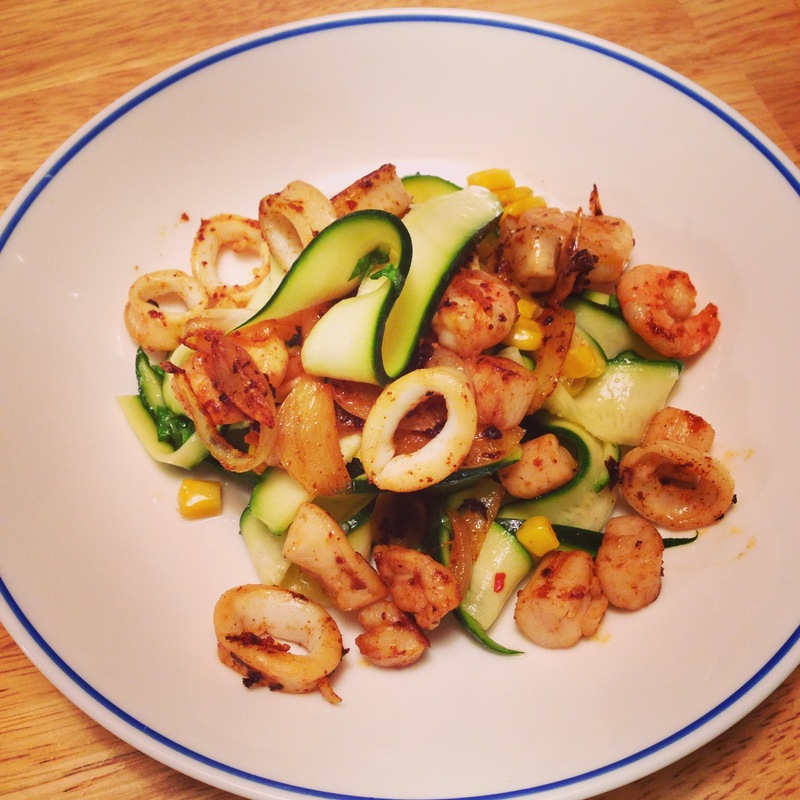 Convenience-wise, shirataki noodles couldn’t be easier – just drain, rinse, and then use! J. Kenji López-Alt from Serious Eats even has a great recipe for Sichuan-style shirataki noodle and cucumber salad and sings their praises here. 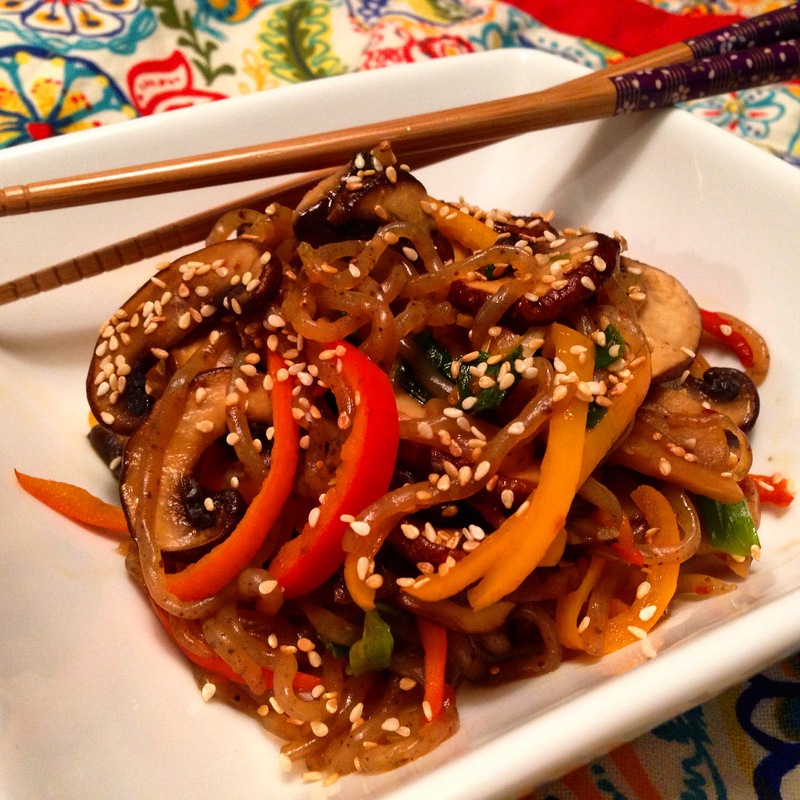 Shirataki noodles stir-fried with vegetables provided a quick and healthy weeknight dinner. No need to feel ‘devilishly’ indulgent, here! Drain and rinse shirataki noodles. Set aside. In a nonstick skillet, heat canola oil over medium-high heat. Add oyster and crimini mushrooms with a pinch of salt to the pan and stir-fry for 1-2 minutes, until they begin to soften and slightly brown at the edges. Add minced garlic, soy paste, sugar, and 1 tsp low-sodium soy sauce. Stir-fry for another 1-2 minutes. Add bell peppers and the chopped white scallion, stir-frying until crisp tender. Add drained shirataki noodles to the vegetable mixture, seasoning with remaining 1 tsp low sodium soy sauce, sesame oil, and sriracha. 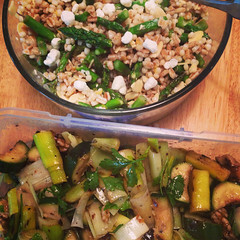 Toss in chopped green scallion and stir-fry for another 1-2 minutes to let the flavors meld. Adjust seasoning. 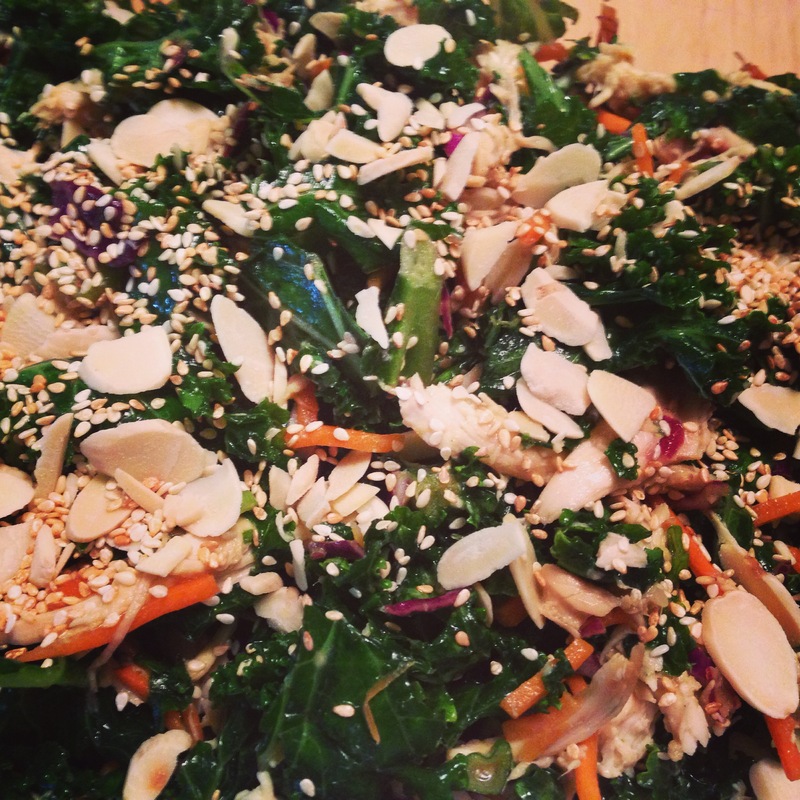 Garnish with toasted sesame seeds and serve immediately. Or more, if you attach to it the immense thoughtfulness that my friend Erika had in bringing back a good quantity of it for me from her travels in Turkey, Morocco, and Greece. I couldn’t join her on her travels, but she helped me get a taste of her adventures by bringing back this cherished spice and inspiring me to experiment with it in the kitchen. Saffron, with its sweet and grassy notes, is truly a labor-intensive spice to collect. It is derived from the stigmas of Crocus sativus. Each plant bears up to four flowers, which each only have 3 stigmas. It takes 150,000 to 170,000 flowers to glean just 1 kg of the precious saffron threads, and requires the equivalent of 40 hrs of labor. It is widely used in the cooking of many cuisines, including the paella of Spain, the Milanese risotto of Italy, the bouillabaisse of France, and the biryani of South Asia. Its vibrant beautiful color adds brightness to all of these dishes, as well as a unique flavor. J and I have used it lately to make paella (recipe to come later!) but tonight I used it very simply to poach cod, with delightful results. 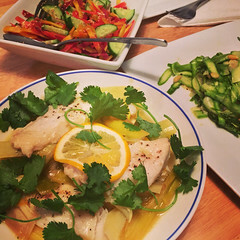 I paired the poached cod and saffron broth with a refreshing shaved asparagus salad. 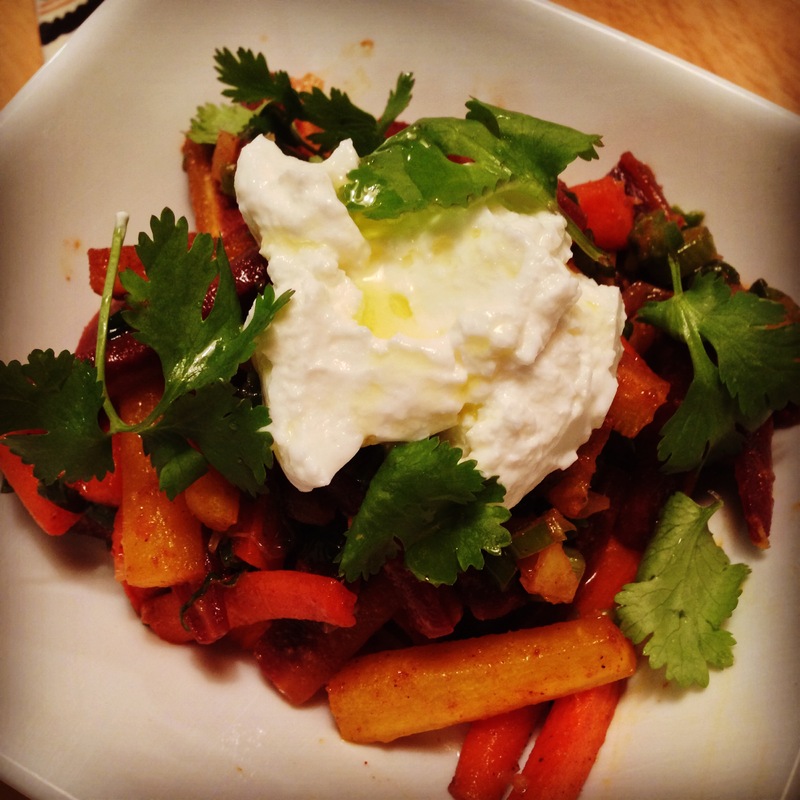 It was a quick and healthy weeknight meal, full of bright and interesting flavors! Gently simmering the cod in the broth is key to achieving buttery, flaky cod (and avoiding rubbery fish). Heat oil in a medium skillet over medium heat. Add garlic and Aleppo pepper (or red pepper flakes) and cook, stirring often, until fragrant (garlic should not take on any color), about 3 minutes. Add tomatoes, wine, bay leaf, saffron, and ~1/4 cup water. Bring to a boil, reduce heat, and simmer until flavors meld, 5–7 minutes; season with salt and pepper. 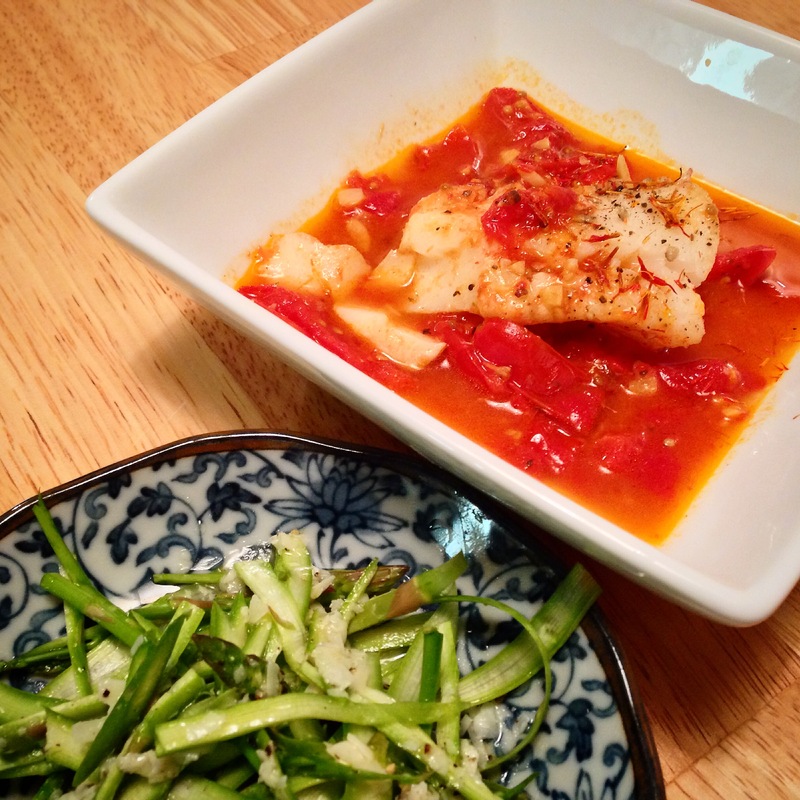 Reduce heat to medium-low; season cod with salt and pepper and place in skillet. Cover and cook at a bare simmer until cod is opaque throughout and beginning to flake, 5–7 minutes (thicker pieces will take longer to cook). Gently transfer cod to shallow bowls and spoon poaching liquid over. Using a vegetable peeler, shave the asparagus into long, thin strips and transfer to a large bowl. In a small bowl, mix the Parmigiano-Reggiano with the lemon juice, water and olive oil. Add to the asparagus and toss to coat. 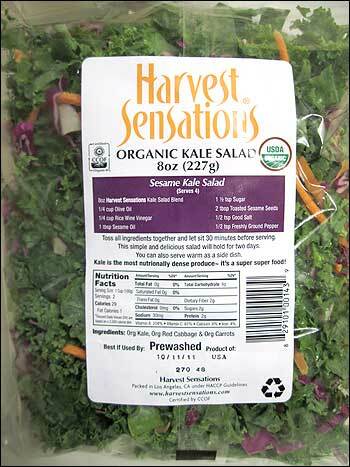 Season the salad with salt and pepper and serve at once. I can be a creature of habit, and as J will readily confirm, rather particular when it comes to certain foods and tastes. 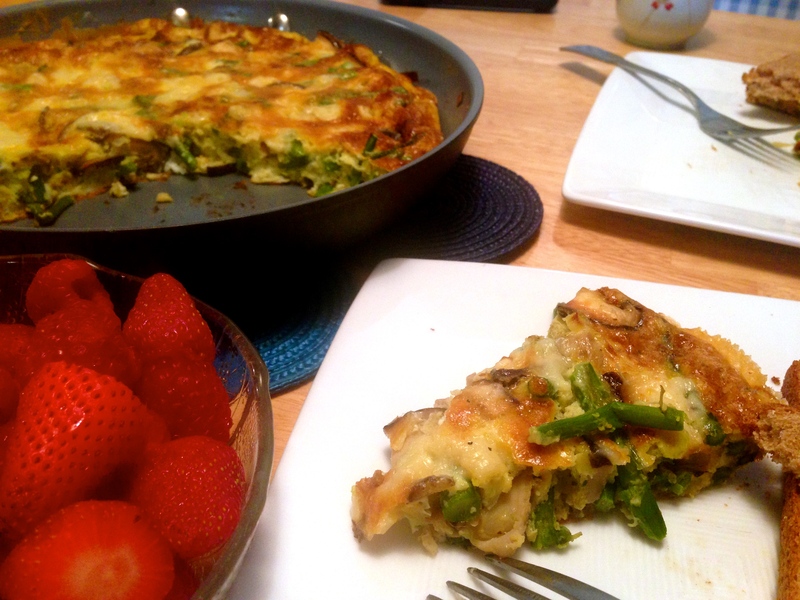 He hypothesizes that we get along so well because he shares a lot in common with my sister L’s tastes, so I’m used to the overlap in the venn diagram of our preferences, even if the “circle” of foods he enjoys is much larger than mine. I disagree – I will eat practically any vegetable or fruit! When it comes to oatmeal, we definitely have our own preferences and tastes. I prefer plain oatmeal that I flavor with whatever I feel like at the time – seasonal fruit, spices, nuts…I like the chewiness of rolled or steel cut oats and I don’t like it when the oatmeal is a touch on the watery side. He is much less demanding and is happy to go with the packaged stuff, and tries to mollify me by making it less watery and using half plain quick oats so that I’m not horrified by the cloying sweetness. 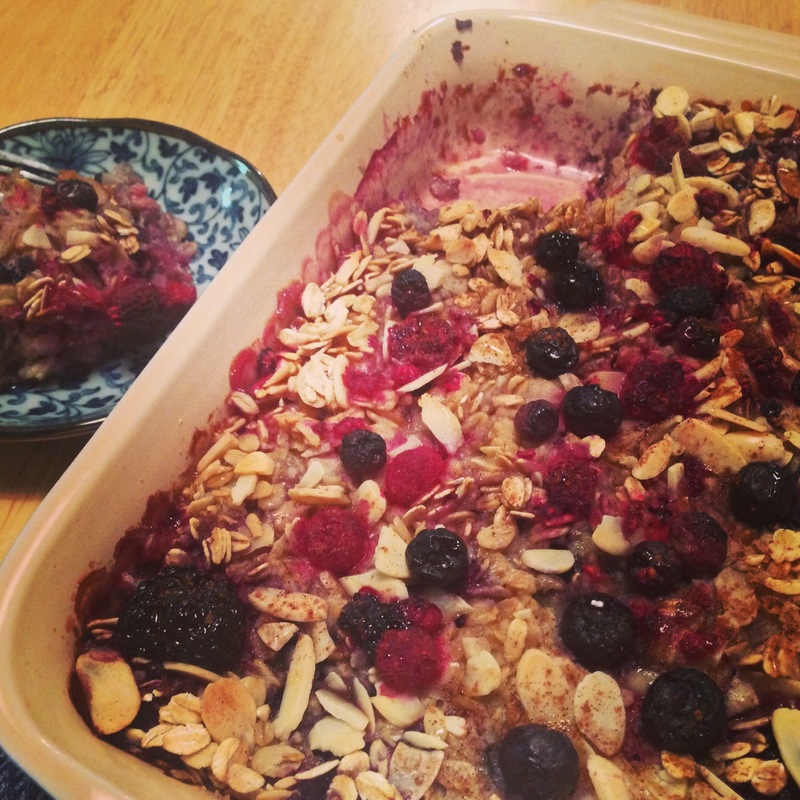 That said, this baked oatmeal is versatile, delicious, healthy…and a perfect compromise! It takes more time than instant oatmeal, but is still super easy to throw together. In a bowl, mix together the oats, half the almonds, the sugar, if using, the baking powder, cinnamon, and salt. In another bowl, whisk together the maple syrup, if using, the milk, egg, the butter, and the vanilla. Arrange the bananas in a single layer in the bottom of the prepared baking dish. Sprinkle two-thirds of the berries over the top. Cover the fruit with the oat mixture. Slowly drizzle the milk mixture over the oats. Gently give the baking dish a couple thwacks on the countertop to make sure the milk moves through the oats. Scatter the remaining berries and remaining almonds across the top. Bake for 35 to 45 minutes, until the top is nicely golden and the oat mixture has set. Remove from the oven and let cool for a few minutes. Sprinkle with a bit more sugar or drizzle with maple syrup if you want it a bit sweeter.